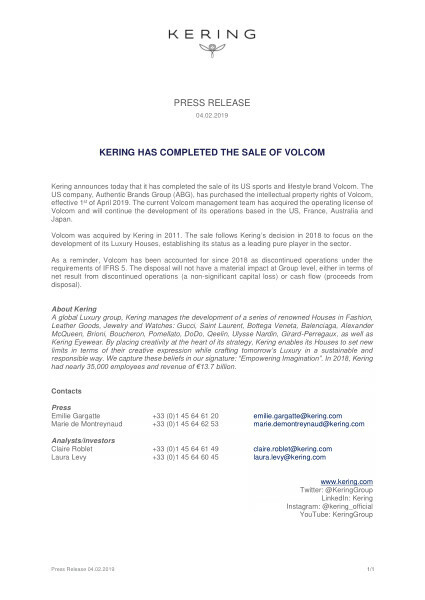 Kering announces today that it has completed the sale of its US sports and lifestyle brand Volcom. The US company, Authentic Brands Group (ABG), has purchased the intellectual property rights of Volcom, effective 1st of April 2019. The current Volcom management team has acquired the operating license of Volcom and will continue the development of its operations based in the US, France, Australia and Japan. As a reminder, Volcom has been classified since 2018 as discontinued operations under the requirements of IFRS 5. The disposal will not materially affect the Group, either in terms of the profit/loss from discontinued operations (a non-significant capital loss) or cash flow (encashment of sale price).